I prepared this review because I’ve spent more hours looking through the eyepieces of spotting scopes than I’d care to remember. The reason for my optical obsession was simple–I wanted to find a scope (hopefully within my budget) that could reliably resolve 6mm bullet holes at 500 meters. I found that, when the mirage is boiling, this is a tall order, even for the very finest optics. In my pursuit of the ultimate spotting scope, I worked my way up from a modestly-priced Bushnell, finally settling on the “supersized” Pentax 100ED. Along the way I owned a Nikon Sky & Earth, and a Pentax 80ED. I also tried out a variety of 80-85 mm objective scopes, including the vaunted Swarovski and Zeiss Diascope. Eventually, with a group of fellow shooters, we put three high-end products through a serious field test. With the assistance of six other shooters, we tested the real-world performance of three premium spotting scopes: Pentax 80ED, Pentax 100ED, and Zeiss 85mm Diascope. In viewing actual targets at 200, 300, and 500 meters, we assessed how well these scopes could display bullet holes on paper. Resolving bullet holes in the black, at very long distances, demands exceptional clarity, contrast, and sharpness. Low-dispersion glass helps with that. All the scopes performed very well. At 200 meters, all three scopes showed bullet holes easily in the white and in the black. 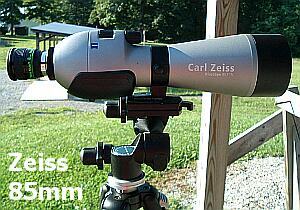 At 300 meters, the edge went to the Zeiss since its fixed-power eyepiece gave a slightly sharper image. Still, all three easily showed bullet holes in the white and most of the time in the black. At 500 meters, all testers felt the Zeiss and the 100mm Pentax were about even with both scopes set at approximately 66X. The smaller Pentax came in a not-too-distant third, a lot to be said for a scope costing $600-$800 less than the other two. However, with the mirage running the day of the test, none of the scopes could resolve bullet holes in the black at 500 meters. I later tested the Pentax 100ED by itself on a clear day with minimal mirage. At 500 meters the Pentax proved itself, allowing me to see 6mm bullet holes, even in the black, no mean feat with my aging eyes. Previously, I found that, with my Pentax 80ED, I could see 6mm bullet holes about half the time at 500 meters when conditions were bad, and nearly all the time when conditions were good. That provided an interesting lesson–namely that, to a great degree, the resolving power of all these scopes may be limited by environmental conditions, especially mirage. In other words, the atmosphere, rather than the glass, is the final limiting factor with scopes of this quality. Moreover, we quickly learned that to get the most out of these scopes, you need a super-stable platform. You can have the most expensive scope in the world but it won’t do you much good if you scrimp on the tripod and head. You’ve got to consider the whole package. Disclaimer: I wish to set the record straight right from the word go. These are my own observations and opinions derived from comparing various spotting scopes in real world conditions. That is to say, at matches viewing bullet holes at various yardages. Please don’t fret if we didn’t test your new “Jupiter Buster” astronomical telescope that, theoretically, can resolve .22-caliber holes in the black at 2000 yards–at night–in a rainstorm. Maybe it can, I won’t argue. If you’re happy with what you have, I’m happy for you. For those still searching, hopefully this review will help shed some light, or at least point you in the general direction. 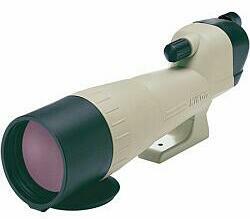 I began this journey early in my shooting career with a Bushnell “Trophy” 16-36x50mm rubber-armored spotting scope. For many years of shooting it sufficed at ranges out to two hundred meters. Alas, as my interest stretched to longer yardages, I began to realize the limitations of the old Bushnell. I opted to replace the aging Bushnell with a Nikon Sky & Earth 20-60x80mm spotting scope, still using my old Velbon tripod. I immediately realized that the Velbon would not reliably support the extra weight of the Nikon so I upgraded the tripod to a Bogen 3021 WN tripod with 3047 3-way head. As tripods go it was like going from a Ford to a BMW. It was much more stable and user-friendly than the Wally World Velbon, but then again, it should be, since it cost over four times as much. The Nikon was much better than the Bushnell. I could now reliably see 6mm bullet holes at 300 meters, most of the time at 400 meters, and sometimes at 500 meters and beyond. The Nikon’s 80mm objective gave a much brighter image and was a vast improvement over the Bushnell. For budget-conscious shooters seeking an 80mm scope, the Nikon is attractively priced. The Bogen tripod was stable, except on very windy days when due to wind vibration. Then the image through the scope at 40-60 power was like looking through a shock wave. Ah, but now I became obsessed with the urge to find a scope / tripod combination that would let me see bullet holes reliably at 500 meters and beyond. Why 500 meters? At the groundhog matches in which I compete, targets are set at three distances, such as 200, 300, and 500 meters. These matches are usually won or lost at 500 meters. If you can’t see hits you can’t make sight corrections to improve your scores. It can be like a crapshoot, throw five shots down range and hope you’re in the bull. To the Nikon’s credit, there were times when the conditions were so perfect that I could see impacts at 500 and beyond, but these were few and far between. I looked through various spotting scopes at every match I attended in an effort to separate the wheat from the chaff. I left the sub-$600 price range behind, venturing into the rarified atmosphere of the “Super Scopes”. Higher prices delivered ED or Fluorite glass, superior construction, plus vast improvements in eyepiece technology. (“ED” or “LD” stands for low dispersion glass–this lessens chromatic aberration, which can cause an image to look fuzzy. All things being equal, low-dispersion lenses transmit a sharper image because different colors [wavelengths] don’t separate as they pass through the glass). The downside of all this research resulted in “sticker shock”. Wow, those babies were expensive! #1 Zeiss 85mm Diascope with 20-60 zoom. The Zeiss, with its large 85mm objective (front lens), edged out the others in clarity and resolution. Its dual-focus system, employing a course adjustment wheel plus a fine adjustment knob, allowed the best resolution of bullet holes at 500 and beyond. #2 Swarovski 80mm with 20-60 zoom. The 80mm Swaro was not quite as bright as the Zeiss because it has a slightly smaller objective. Otherwise, it was an outstanding performer, coming in a very close second to the Zeiss. At this point, I must say that none of the three could resolve 6mm bullet holes at 500 and beyond 100% of the time, especially when the mirage was running at its worst. I chose the Pentax 80ED as my next scope purely on the basis of pricing. Both the Zeiss and the Swarovski nearly twice as much as the Pentax. The Pentax, mounted on my 3221WN tripod with the 3047 head, proved to be a good performer that allowed me to see bullet holes about 50% of the time at 500 and beyond when conditions were bad, and 100% of the time when conditions were good. With my new Pentax 80ED, I was happy–for a while. Then came the winter and lots of time to think. I began to wonder if there was some scope / tripod combo that would work better than even the Zeiss and Swarovski? Research revealed some glowing reports about the Pentax PF 100ED with 26-78 zoom. I began to do more research, and although a lot of New York camera shops advertised the PF 100ED, few actually had them in stock, and if they claimed they did, the price was very high. Besides I wanted to see one in the flesh, ideally to compare against what I already knew to be the best of the best. Well let me tell you, locating a PF 100ED was like tracking down “Bigfoot”–plenty of claimed sightings, but nothing I could get my hands on. During this time I accidentally stumbled onto what I consider to be the ultimate tripod / head combo as far as stability goes for our intended use, although some will argue in favor of the massive surveyor tripods that many 1000-yard shooters favor. That would be a Bogen model 3251 with a model 3039 head. Later in the article I’ll explain what makes these units so good. Word to the wise: You can have the most expensive scope in the world but it won’t do you much good if you scrimp on the tripod and head. You’ve got to consider the whole package. Another important thing to remember when choosing tripods is to buy one tall enough so that you do not need to extend the center column. The setup will be most stable, and less susceptible to wind and vibration, with the center column at its lowest setting. Now, back to the elusive “Bigfoot” 100mm Pentax. As winter ended and spring arrived I still hadn’t found any place where I could actually handle one. Some of the New York camera shops claimed they could furnish one, but at $1600+ I balked at buying one sight-unseen. I contacted Pentax USA and they didn’t have any either! They told me that it wasn’t a popular model due to the price and size. 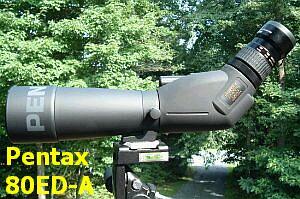 Their main sales were of the 65mm and 80mm versions to birders and wildlife observers. In fact, the Pentax Rep confided in me that the 100ED might be discontinued due to low sales volume. So, I put the idea on a back burner until I received a call from Pentax in mid June. The extremely helpful lady at Pentax arranged for me, through a great effort on her part, to get my hands on one of the elusive PF 100EDs. 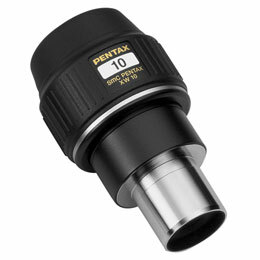 PENTAX Spotting Scopes Objective Focus Body Weight Eyepiece Wt. The PF 80ED was considerably less massive, so I mounted in on my lighter 3221 tripod. The big 3251 tripod was the logical choice for the heavier and longer 100ED. Then it was time to head off to the Shippensburg Fish and Game Club, my home range, to compare the scopes side by side, viewing targets at 500 meters. If you’ve ever shot Shippensburg, you know it can be one nasty range when it comes to mirage, not to mention winds from all directions. Now it was time for a serious field comparison of the high-end spotting scopes. We gathered six long-distance shooters to try out the scopes at a real range, looking at real bullet holes in real targets. I brought the Pentax 80ED and its 100mm big brother. Unfortunately a Swarovski 80mm was not available, but we lined up a Zeiss, arguably better than the Swarovski in any case. I made arrangements with Chip Allen, a good friend, to bring his Zeiss 85mm Diascope, equipped with a Teleview Radian 8mm (66x) fixed-power eyepiece so we could compare the three side by side. We decided to compare the three at different yardages using the actual targets we were shooting. The testers included myself and six other shooters–that way we had many sets of “eyeballs” with which to judge the scopes’ merits. 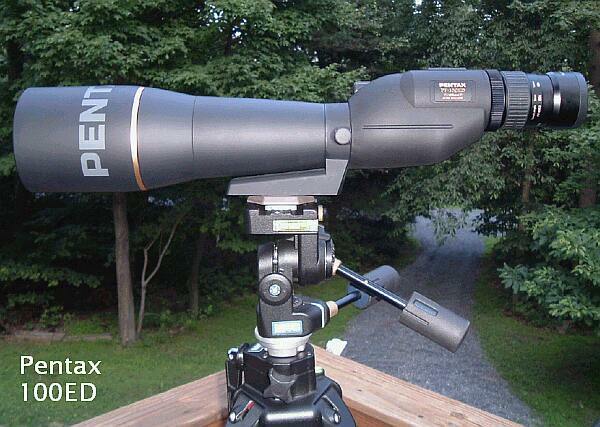 The Zeiss and Big Pentax were set at 66X, while the Smaller Pentax was set at its max 60X magnification. I feel a note about eyepieces is in order. First, should you chose a straight (inline) eyepiece mount, or angled? For the birder who is looking through a scope for hours on end the angled is definately the way to go–it really saves the neck. For shooters, the angled is worth considering since you can rotate the scope’s barrel a full 360 degrees. With the scope mounted to your side, and the angled eyepiece turned at 90 degrees, you can simply turn your head slightly and look through the eyepiece. That’s nice when the benches are cramped, and it may be essential when shooting prone. There is a trade-off though–an angled eyepiece mount adds one more mirror that reduces the clarity of the image somewhat. You’d never notice it until you compare two scopes, one angled and one straight, side by side. Then it’s apparent. As to magnification, remember that fixed-power eyepieces usually render a sharper image than variable-power eyepieces. Is the extra clarity of a fixed-power eyepiece outweighed by the zoom’s ability to dial up and down as conditions and mirage change? You must decide for yourself. Personally, I like being able to dial down a variable to 20X–a power level that delivers a nice, wide field of view. It’s much easier to get on target at 20X than 66X. For me, the zoom eyepiece’s ability to match magnification to the conditions more than makes up for a fixed-power eyepiece’s slightly superior clarity. Of course, if you have the cash, you can buy both versions–fixed and variable. (Swapping eyepieces takes just a matter of seconds). The question is, how deep are your pockets? A quality fixed-power eyepiece runs $240-$300. At 200 meters, all three scopes showed bullet holes easily in the white, and also in the black for that matter. At 300 meters, the edge went to the Zeiss since the fixed power eyepiece gave a slightly sharper image. Still all three easily showed bullet holes in the white and most of the time in the black. 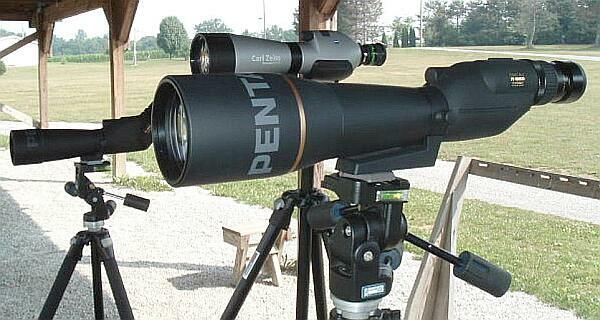 At 500 meters, the Zeiss and the big Pentax were about even to everyone present with both scopes at approximately 66X. Cranking the power up on the big Pentax to 78X and it gained a slight edge with the added 12X of magnification. The smaller Pentax came in a not-too-distant third, a lot to be said for a scope costing six to eight hundred less than the other two. The two big scopes were easiest to see bullet holes with, but none allowed us to see holes in the black at 500 meters with the mirage running, on that particular day. I returned to the range the following Tuesday, our usual “fun shoot” day, to try the big Pentax in simulated Match conditions. It was a beautiful day with a slight headwind and the mirage was almost non-existent. At 500 meters the Pentax proved itself, allowing me to see 6mm bullet holes, even in the black–no mean feat with my aging eyes. The superior light-gathering ability of the big 100mm objective combined with powerful 78X magnification made this possible. So, which scope was the best? Our seven-man jury decided it was toss-up between the Zeiss and the big 100mm Pentax, with opinions split about evenly. The Zeiss offered a very sharp view through the glass. However, some of the Zeiss’s exceptional clarity can be attributed to its fixed-power eyepiece. That was balanced by the versatility offered by the Pentax. We liked the 100ED’s zoom eyepiece that could go down to 20X for a wide field of view, or all the way up to 78x for max magnification in good conditions. The Pentax 80mm is a very good scope, at a bargain price compared to the other three. All have ED or Fluorite glass, all are water-resistant or waterproof, and most have lifetime warranties. The Zeiss and smaller Pentax are the most compact, with the 100mm Pentax being the largest and heaviest of those tested. What’s the Bottom Line? If you chose any of the three scopes we tested you can’t go far wrong. I would also add the Swarovski 80mm to the list of truly great scopes, based on my earlier range observations. (If you’re curious about the Swaro, see this thread BirdForum.net where owners compare the Swaro to the Zeiss. There is also a very good discussion of Zeiss eyepiece options.) The 100mm Pentax, Zeiss Diascope 85mm, and the Swarovski 80mm are three premium, state-of-the-art optics. Right now, I’m the happy owner of the big Pentax PF-100ED, with the 26-78X zoom, but you never know, this winter, when the snow’s blowing, I may read about and even bigger and better spotting scope, and here we go again! No sooner was Danny’s article released than folks began asking about some of the other high-end scopes we didn’t have a chance to test this time around. These include the new Nikon 82ED FieldScope, the 100mm Optolyth, and the new Kowa 823/824 with ED glass. Let’s take those in order. User reports on the Nikon are very positive, and at about $1000 (street price) for body only, it’s a little cheaper than the Swaro or the Zeiss. If you’re looking to spend $1000+, you should take a look at the new Nikon. The German-made Optolyth 100mm is big and heavy, but it is extremely well made and the optics are outstanding. Optolyth’s maker was the first company to use Flourite lenses. Here is an Optolyth 100 User Review. Lastly, the new high-end Kowa TSN 823/824, with low-dispersion glass has garnered excellent reviews. Many of the bird-watchers say it beats the 80mm Pentax optically and is easier to focus than the Swaro. Unlike the Zeiss and Pentax, however, the big Kowa only takes Kowa-brand eyepieces. 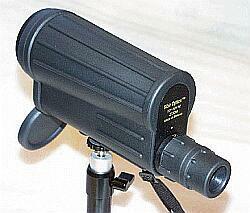 Most of the top-of-the-line spotting scopes can use a variety of 1.25″ astronomy eyepieces (adapters may be required). Anyway, if time and money permits, in the future we’ll try to get our hands on a Nikon 82ED and a Kowa 823M, and share our findings. Five Benjamins may seem a hefty chunk of change for your first spotting scope, but since that includes a quality 20-60X zoom eyepiece, this is really a pretty good deal for a sharp, well-made optic. Danny has quite a bit of experience with the Nikon S&E, and he recommends it: “In my opinion the 80mm Nikon Sky & Earth trumps everything in its class. For guys on a budget the Nikon is unbeatable in that price range.” Danny has looked through many Kowas at similar price levels, and he believes the Nikon outperforms the Kowas when it comes to clarity and resolution. The older all-metal Star-D tripods are well-designed and rugged. You can pick them up for next to nothing used, in great condition. These all-metal rigs were used for years in the movie industry for cameras, so they’ll easily support the weight of a big spotting scope. Virtually all components, even the knobs, are machined metal. On my 70s-vintage Star-D, all the knobs and adjusting handles unscrew and fit in the center tube–a nice feature that makes the tripod much more stream-lined for transport and storage. Tilt and pan controls are smooth and lock-up is very positive. The leg adjusters are rotating cam-lock bushings that won’t snag and are virtually unbreakable. All hardware is aluminum so there’s almost nothing to rust. The best thing about the old Star-Ds is the price–you can find them on eBay for as little as $10, and rarely more than $40, in like-new condition. Only purchase the solid tubular all-metal version, not the newer Davidsons that have many plastic fittings. And make sure ALL the control knobs and levers are included. I’m not ashamed to admit I have one of these compact, 1.5-pound, rubber-armored units. While its clarity leaves much to be desired, and the eye-relief is annoyingly short, it has performed well for many years. Just 9.5″ x 4.5″ (small enough to fit in many glove compartments), it is a functional, low-cost “back-up” scope that will do the job from 10 to 200 yards. If you set the power below 36x or so the view through the glass is reasonably sharp with minimal distortion. This scope stays in the car all the time and is the only thing I use when shooting pistol or rimfire. It’s no “Super Scope” but I can see 22-caliber bullet holes in the black at 200 yards, so it serves its purpose. I’ve dropped the scope a time or two, and the rubber armor did its job. The only thing I really don’t like is the ultra-short eye relief, but for a $75 product that’s so compact and handy, I can live with that. I’ve taken it on rafting and sailing trips since it’s cheap enough that I wouldn’t cry if it fell overboard. We’ve found that, at long-range varmint matches, where a friend is allowed to spot for you, a large, star-gazing type scope has many advantages over smaller scopes designed for field carry. First, the scope’s bright image and generous eye-relief allows viewing for long periods of time without eye fatigue. (With the scope mounted on a tripod in front of a chair or camp stool, the spotter can comfortably watch a whole relay). Second the very large objective lets the viewer see both the target and wind flags many feet away. At 600+ yards, with a conventional 60-65mm scope, you’ll often have to move the scope back and forth between flags and target. For the kind of long-duration, “sit-behind” spotting we do at varmint matches, a very nice scope is the Orion Apex™ 102mm Maksutov-Cassegrain. Using a similar Meade-brand Cassegrain scope, I could easily spot flags and silhouettes at the same time, and the scope gave a spectacular view of trace. The Orion is quite a bargain at $279, including a 25mm eyepiece which delivers 52x power. While the budget-priced Orion won’t rival a $1500 Zeiss for resolution, it is surprisingly sharp, and its big objective really makes the spotter’s job easier. User reports have been very positive. (See Astromart Review and Anacortes Scopes Review). It’s a great choice for all-day-long, sit-behind spotting duties, calling shots on steel. But don’t expect it to resolve bullet holes at long distance the way a premium $1000+ scope with ED lenses can! It was a snowy day outside, and I was perusing E-Bay in the photography section, when I came upon a unique ad. It seemed that a major western university was in the process of upgrading all of its photography equipment and was selling everything on E-bay in a rather unconventional manner. It wasn’t the usual bid process common to E-Bay; it was a “make offer” auction. If they found your offer acceptable you got the item. Well one of the items happened to be a Bogen 3251 studio tripod with Bogen 3039 professional three-way head, including the optional leg extensions, and in excellent condition with only a minor scratch on the Bogen decal. I quickly checked Bogen’s website and found this combination to be upwards of $750 suggested retail. I contacted the seller and he assured me that the condition was as claimed, with the tripod only having been used perhaps two or three times, it’s size and weight being unpopular with the students. I thought what the heck, and sent him back an e-mail offering a low-ball $200, expecting a counter-offer in return. Low and behold, his next e-mail accepted my offer if I’d kindly include $35 for shipping! Of course I jumped on it and closed the deal in a flash, my only regret being that since he had two I didn’t buy them both. I could have sold the other for $400 and have gotten mine for free. Foolish boy. As you can see, the 3251 has the advantage of more weight, and leg-bracing, which, together, add stability in windy conditions. It also has niceties such as bubble levels, quick-release legs, and a super smooth three-way head that is a dream to use. The 3251’s drawbacks are that is it is bulky for storage and transport, and it’s twice as heavy as the 3221 WN. Bottom line: In the wind I’ll take the 3251 hands down. It’s that stable. The 3221 WN on the other hand packs well and is easier to carry. Here’s my final Tripod Tip: Tie a piece of light rope with a loop at the bottom to the center column of the tripod. Use your foot in the loop to help add instant weight when the wind is blowing.